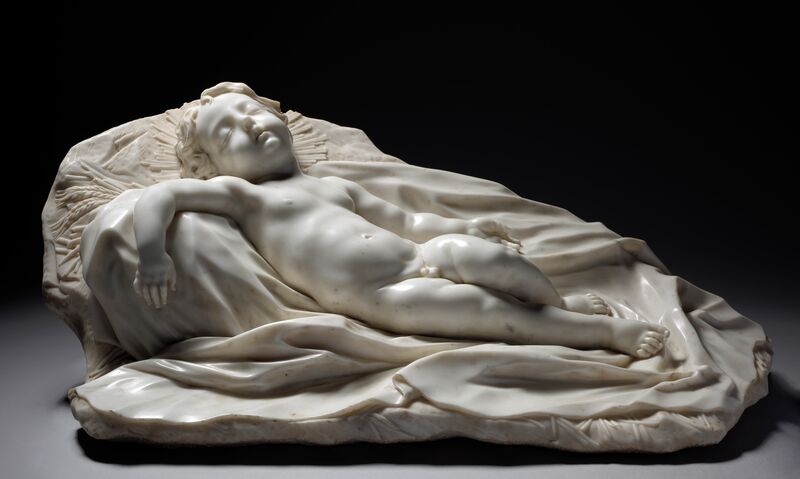 Cleveland, OH (December 11, 2018)—The Cleveland Museum of Art (CMA) today announced the acquisition of Filippo Parodi’s Sleeping Christ Child, an outstanding example of monumental Italian Baroque narrative sculpture. Parodi began his career as a woodcarver and subsequently worked in both wood and stone. He made two trips to Rome where he worked in the studio of Gianlorenzo Bernini (1598–1680), the leading sculptor of the Italian Baroque. The French sculptor Pierre Puget (1620–1694), active in Genoa during the 1660s, was also a key influence. After Puget’s departure from the city in 1669, Parodi became the leading Genoese sculptor in wood and marble. Images of the sleeping Christ Child appear often in Renaissance and Baroque art, introducing both a premonition of Christ’s fate and underscoring the notion of sleep as a metaphor for death. Here, ears of wheat among the straw allude to the Eucharistic sacrament. Parodi adapted the composition of his Sleeping Christ Child for at least two later sculptures depicting the dead Christ: a polychrome wood sculpture in the Church of San Luca in Genoa; and the central figure in a pietà made for the Church of Santa Giustina in Padua. In both, Christ’s lifeless body assumes a pose nearly identical to that of the sleeping child in the newly acquired work. The languid sensuality of Parodi’s figure recalls secular models as well, namely the Sleeping Cupid, a popular theme since antiquity. Monumental works by Parodi, or other leading sculptors of the Italian Baroque, rarely appear on the market. Apart from occasional portrait busts, Sleeping Christ Child is among the most important marble sculpture by an associate of Bernini to have come on the market in recent years. The CMA’s existing collection of European sculpture from the late 16th through the 18th centuries includes individual works of exceptional quality. With this new acquisition, the collection now boasts an outstanding example of monumental narrative sculpture that brings an exciting dimension to the museum’s presentation of Italian Baroque art. Sleeping Christ Child is now on view in the Reid Gallery (217). Sleeping Christ Child, c. 1675. Filippo Parodi (Italian, 1630–1702). Marble; 63 x 102 x 42 cm. The Cleveland Museum of Art, Bequest of Leonard C. Hanna Jr.